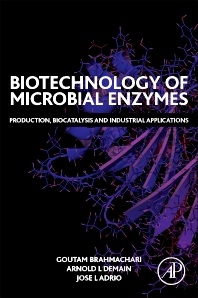 Biotechnology of Microbial Enzymes: Production, Biocatalysis and Industrial Applications provides a complete survey of the latest innovations on microbial enzymes, highlighting biotechnological advances in their production and purification along with information on successful applications as biocatalysts in several chemical and industrial processes under mild and green conditions. Applications of microbial enzymes in food, feed, and pharmaceutical industries are given particular emphasis. The application of recombinant DNA technology within industrial fermentation and the production of enzymes over the last 20 years have produced a host of useful chemical and biochemical substances. The power of these technologies results in novel transformations, better enzymes, a wide variety of applications, and the unprecedented development of biocatalysts through the ongoing integration of molecular biology methodology, all of which is covered insightfully and in-depth within the book. Graduate students and established researchers in biochemistry, molecular biology, microbiology, cell biology, structural biology, synthetic chemistry, food science, and pharma.